If you can't handle "blood, gush, and tears" then I suggest you skip this post altogether or just skim over the pictures. Or, if you're like me and could read exciting birth stories all day long for some weird reason, by all means, continue on! After our impromptu photoshoot I wanted to take Chris shopping at the GAP to get some birthday clothes - he turns 27 on Friday! Yes, I'm a cougar, marrying a younger man :) We got him some shirts, I got a dress and top, and we perused through J Crew and a few other stores - enjoying our final moments of time alone while Grandma stayed home with Fox. Then we went to Target and got some new bedsheets cuz ours are old and dingy. And we needed doggie poop bags - FYI. Somehow we ended up with organic bedsheets and decompostable poop bags - like we're "green" and "earthy" or something! When we got home after running errands we were starving so my mom made us delicious "Marlboro Man Sandwiches." So good. I'll always remember Fox chucking a french fry across the dining room, us laughing super hard, so of course he did it again and again... Silly boy likes to make us laugh. At 1pm we put Fox down for a nap. I was about to take my daily nap too but of course I had to use the restroom first. As I was peeing I felt/heard the strangest "pop!" and a gush of liquid came out. I think? I was peeing so I couldn't really tell! The water was cloudy but Chris says my urine is always cloudy cuz I don't drink enough water. I remember when they broke my water with Fox contractions started happening shortly thereafter so I decided I wanted to wait and see if this was the real deal. I called the hospital and asked if I should come in and they said yes, but I was super hesitant after being sent home Wednesday night. Just a few minutes later, I had a contraction. A painful one. And then another one a few minutes later. We scrambled around packing up our things, I posted on this here blog at 1:34pm saying that we were off to the hospital, and away we were. Ready or not, here comes Baby Jane! 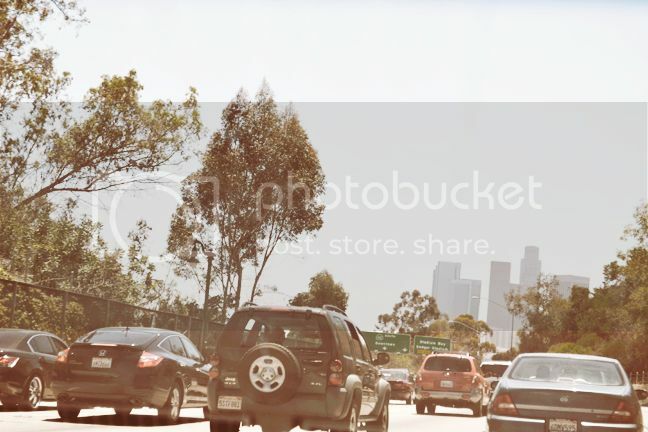 The hospital is 14 miles away, but remember, we live in Los Angeles - the city with the worst traffic in the country. Awesome. I was feeling pretty good for about 10 minutes, then my contractions REALLY started hurting. I called the hospital and begged for an anesthesiologist to be waiting for me at the door. They didn't really encourage me - just said there are doctors and nurses there 24/7 - no duh. Chris dropped me off at Emergency. As soon as I got out of the car and had to move around I was in constant pain. I was crying. I was miserable and scared. I was wheeled up to L&D and admitted. On Wednesday night the admission process took like two hours - question after question, test after test, a super long ultrasound. There was no time for that. I needed drugs. To quote Keri Russell in one of my favorite movies, Waitress, "I want the maximum legal amount of drugs." The only thing I actually filled out on my labor plan was: "The following statement best describes how I feel about pain medication: I want the pain medicine/epidural to be given as soon as I am in labor as is safe and allowed." I don't like pain, I have a very low pain tolerance. 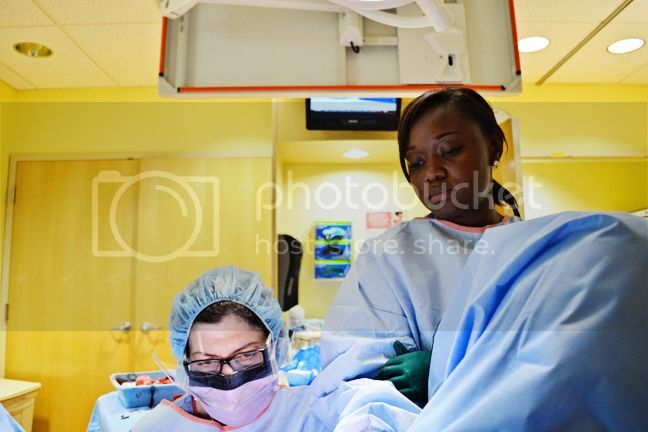 Give me an epidural - done and done. 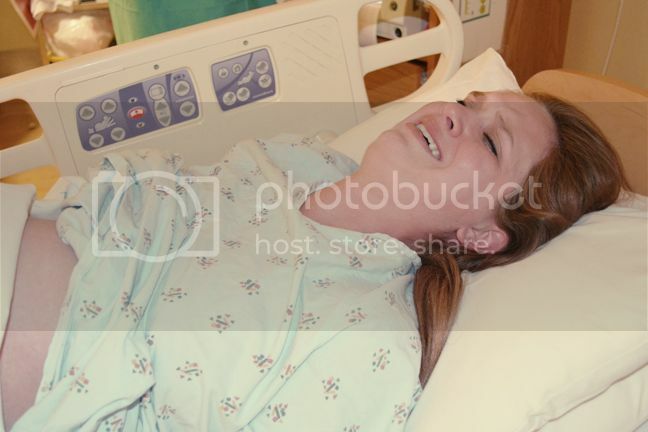 Then the nurse checked my cervix. She said the dreaded words I've had nightmares about this entire pregnancy, "You're at a 10, we can't give you anything at this point, it'll just make you and the baby too tired." I started screaming, "NO! YOU HAVE TO GIVE ME SOMETHING! CHRIS, I CAN'T DO THIS! YOU KNOW ME! I DON'T DO PAIN! I CAN'T I CAN'T I CAN'T! YOU GOTTA GIVE ME SOMETHING! PLEASE PLEASE PLEASE!" Nobody was listening to me. Hardly anyone was talking. I was wheeled into the delivery room and somehow hoisted myself onto the bed. At this point it was about 2:10pm. The next 18 minutes or so were a blur. I was in hysterics. My body took over and started pushing uncontrollably. I kept screaming "IT'S MAKING ME PUSH! IT'S MAKING ME PUSH!" Nevermind who or what the "it" is? The doctors and nurses were in position and they asked me to follow their instructions for pushing. They asked if I wanted to feel Baby Jane's head crowning - which I did - and it gave me the motivation to keep going. 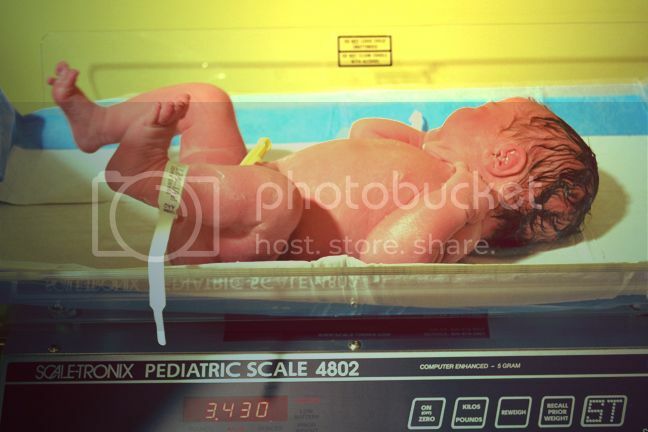 The next urge to push came, I listened to the doctor's instructions about when to breathe and when to push, and the next moment, Baby Jane was born at 2:28pm. Not even an hour after I blogged that we were going to the hospital. It all happened soooo fast. They put Jane on my chest, but I was shaking so severely and covered by my gown, that they took her away soon thereafter and washed her up while I was stitched back together for over TWO HOURS. They were all up in my business. Luckily they were able to pump me full of morphine through an IV and a shot before poking me with needles. It made me dizzy and tired but it was nice. They also gave me lidocain shots down there while they were stitching me up so it wasn't too bad. When they finished putting me back together they gave me back my baby and all was right with the world. Jane getting her fuzzy hair washed. 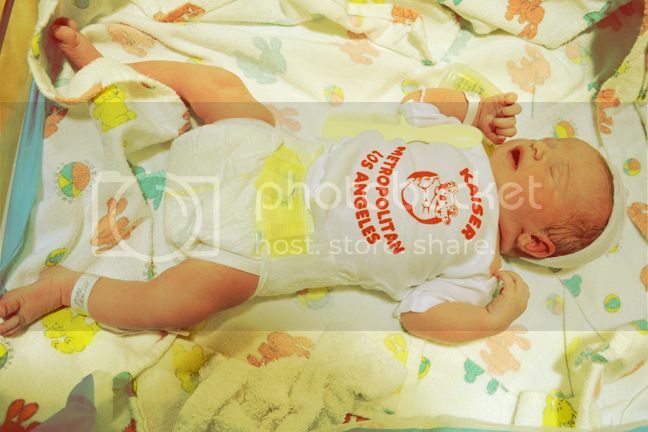 Jane's first diaper of thousands and first little t-shirt. 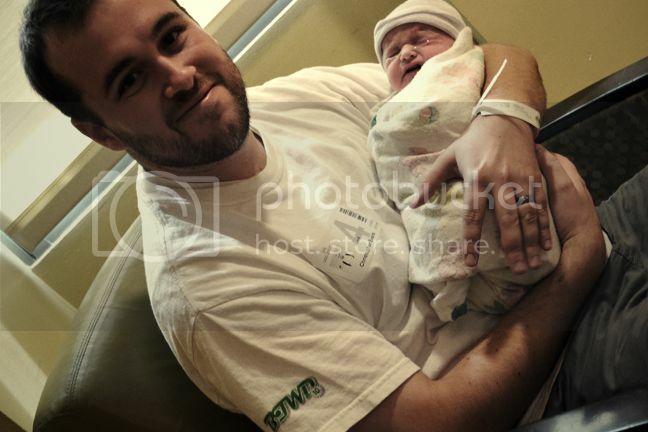 Chris holding his baby girl for the first time. Proud Daddy. I was wheeled up to Post-Partum and bombarded by nurses, doctors, and the money man. Finally things slowed down and we were able to enjoy our time together and start letting the world know about our whirlwind experience via Twitter/Facebook/Instagram/Texts/Blogging. After dinner Grandma Carolyn and Big Brother Fox arrived! Seeing Fox meet his little sister for the first time was such a spiritual experience. He's going to be a great big brother, I can already tell. Grandma oogled and googled over her first granddaughter, natch. SO. I am now part of the "au natural" club, albeit involuntarily. And here I was thinking my body doesn't know how to go into labor on its own cuz essentially I was induced with Fox and planned on getting induced with Jane. I must say, and I don't know whether it's just because this is my second baby so I know what to expect as far as recovery goes, but I feel much better physically this time around. I can stand and walk and change my (yes, MY) own diapers. I'm definitely not thinking about having another baby anytime soon, but I will have to seriously consider which route I want to go giving birth next time. Because as scary and crazy as going natural was, it was all over so fast, I've already almost forgotten how bad it was. And now I have a sweet daughter to smother with loves and hugs and kisses! Congrats, Paige. I hope the next few days leave you feeling better, relaxed and happy. 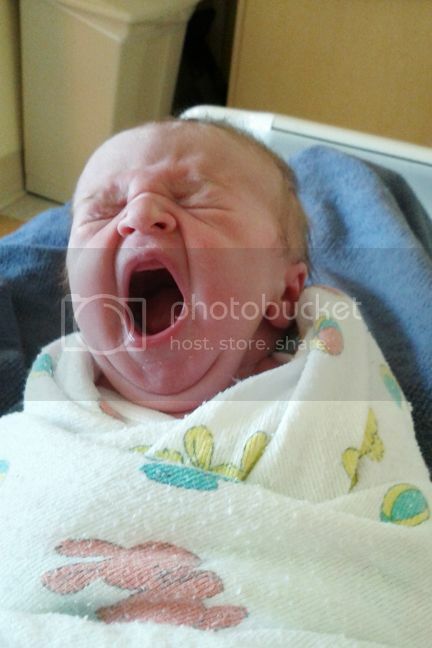 CONGRATULATIONS on the birth of baby Jane withOUT any pain relief!! GREAT achievement! It's kind of awesome that you didn't get to decide what birth route it will go...because life is full of sweet surprises! 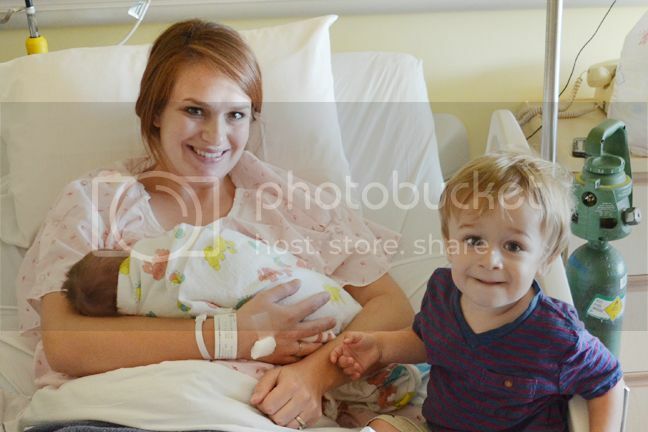 I can't believe that you wrote this most memorable post right before/almost during/right after the birth! Enjoy and rest up! So happy for you, Paige! Ohhh I'm sobbing like a baby. Becoming a mama, no matter who it is, first time, last time, 5th time, is such a beautiful thing. One of my favorite pictures ever is of my 18-month old son coming to the hospital to meet his baby sister for the first time. Thanks for sharing. Be well, be happy - all of you. Congratulations on your newest family member. She is a doll and dont you kind of feel like a rock star now? Hope you all are getting some rest! Oh my goodness, congratulations! What a birth story, won't forget this one anytime soon! Congrats!! Aww, she is beautiful! Welcome to the world Baby Jane! Congrats to all you on your precious new bundle! Caleb and I were screeching in sympathetic horror at one paragraph after the next! We said it all seemed like a sitcom, until I saw the look on your face right before you started pushing—then, I decided it was more drama than sitcom. We love your little babies and think you are awesome! what a fun story! SO Exciting!! CONGRATS to you and your family! She is a BEAUTY! Big congrats to you and Chris! Thanks for sharing your wild story and for sharing all the gory details! LOL! Jane is GORGEOUS! And you look radiant, as always! Enjoy your newborn, it goes much much too fast. Even faster the second time, if you can believe that. My second time, I healed MUCH faster too. Hopefully, you'll be feeling good as new soon. Thanks for sharing with us and I'm sending lots of love over to your family! I knew this was going to be a great birth story!! So proud of you. Again, Congrats...you did a good job! Congratulations, Mommy and Dad and welcome Jane!! Quite an exciting start! Thanks for sharing! Congrats! She is so sweet! What a story! Congrats on your sweet little baby! Way to go Supermom! Wow!! What an amazing story! 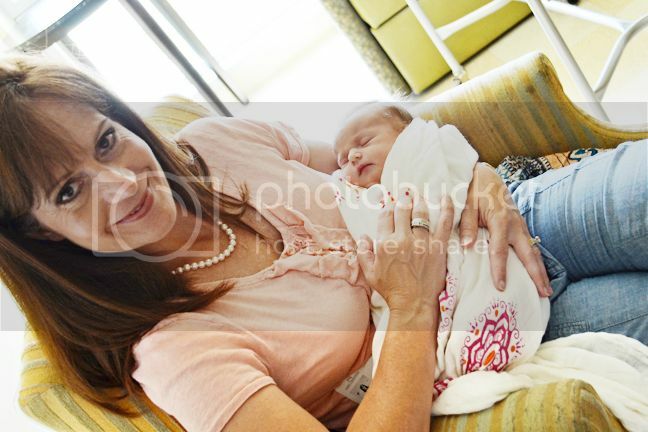 But the look on your face holding your beautiful new daughter says it all!!! Congrats! She is so beautiful!!!!!! And I hear ya girl -- all three of my kids were under an hour of labor (the first one being only 25 minutes of labor!!) 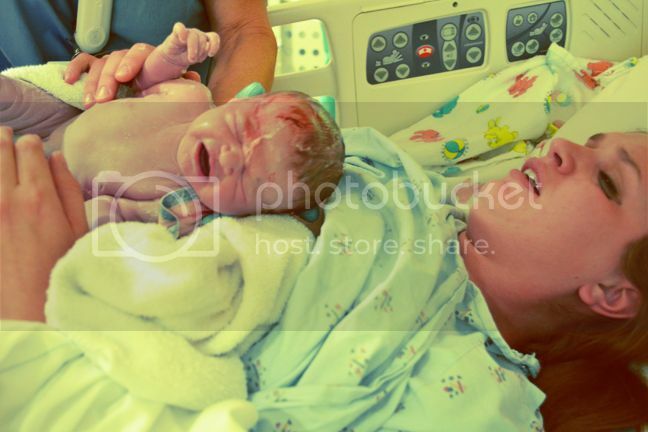 -- I never got pain killers, epidural or nothing... they all came too fast! So I feel your pain!! But huge CONGRATS!! What an amazing story! What a woman to do it with no pain meds, too. She is a little beauty. Congratulations, Paige and family! congrats!!! such a great birth story!!! I LOVE reading them!!! she is such a cutie and congrats!!! Congratulations!! She is beautiful and you will have quite the story to remember it by! Enjoy her!! CRAZY!!! So glad everything is ok! 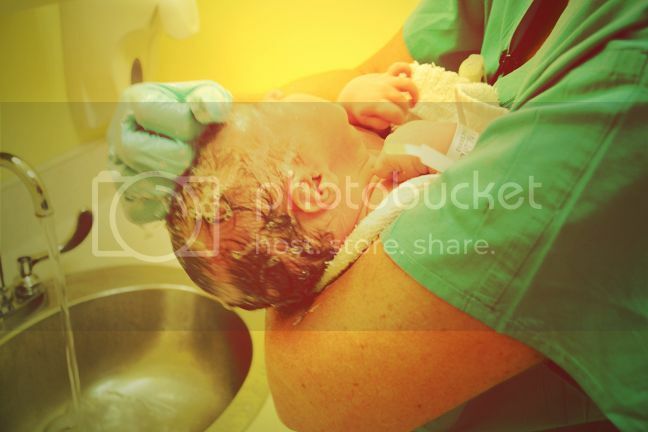 Now you can do anything if you can give birth without an epidural! Oh my goodness! Congrats. Wow, it's so crazy how every birth experience is different! Aww. Enjoy your new baby girl!! Aw! Way to go, girl! I did it with both of mine. Although, I think I have a pretty high tolerance for pain, and needles terrify me. So, it was completely my choice, but I wouldn't have done it any other way. So proud of you! What precious pics! TFS! Enjoy every minute! Hugs! your AWESOME! I'm so happy for you:)i'm praying for a speedy recovery for you and lots of happy moments of getting to know your baby. great photos and loved the story! we had a very similar experience with our daughter this past February. even down to becoming part of the au natural club un-voluntarily. (shootballs) congrats to all involved! Just wanted to congratulate you again. She is the most adorable baby I've seen and you can be so proud! I went through labor without pain relief (my choice) and it hurt but I had chosen for it. Being confronted with pain so quickly is scary but you conquered it. Enjoy baby Jane. Sending you millions of hugs! Congrats! So happy for you. Thanks for the birth story, I love to read them too. 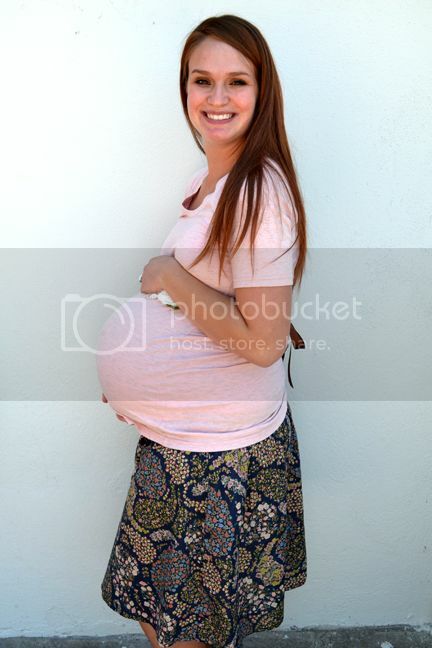 I am due in 39 days with my second so this story is very close to home!!! Love the story, Paige! 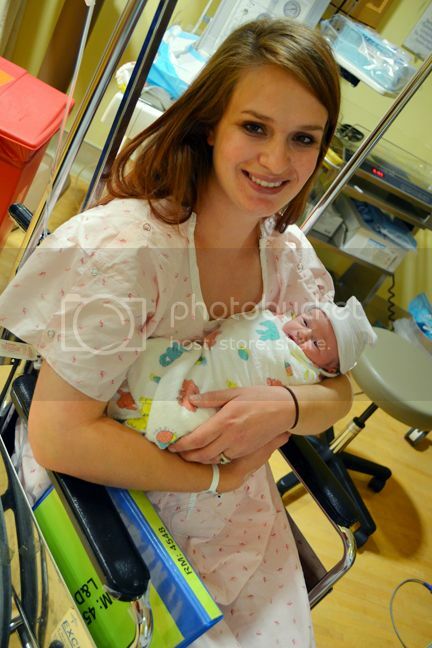 :) My second one came just as fast and I felt so cheated out of the epidural! Not cool. LOL! BIIIIGGG HUGS darling! Congrats again.. I've had my 4 babies & each one I had 8 hr labors Go figure Did 2 natural (My oldest at a birthing center) Then my youngest was at home (yes on purpose)& those were the fastest recoveries & sweeter (ok not my oldest that was a bit more work lol guess being the 1st lol) but over all if I could I'd have all 4 of my babies natural. congrats! she's such a cutie and kind of looks like fox! oh gosh, after reading this i think i'm going to be adopting. too much for me. but she is absolutely beautiful! can't wait to see more pictures!!!!!!!! I am so happy for you and baby Jane!! She's beautiful. The pics of Fox meeting her are sooo sweet!! HUGE congrats and i hadn't planned on reading every word, but I did! Can't wait to meet your sweet baby Jane! Enjoy this time (i know you will)! Congratulations! We're so happy for you. And way to go on an unmedicated birth (even if it wasn't exactly preferable at the time). Jane is beautiful! I love reading birth stories, especially since I'm hoping my own happens soon. Congrats on a beautiful baby girl! Congratulations Paige! and Big Brother Fox and Daddy Chris. Well the whole family. 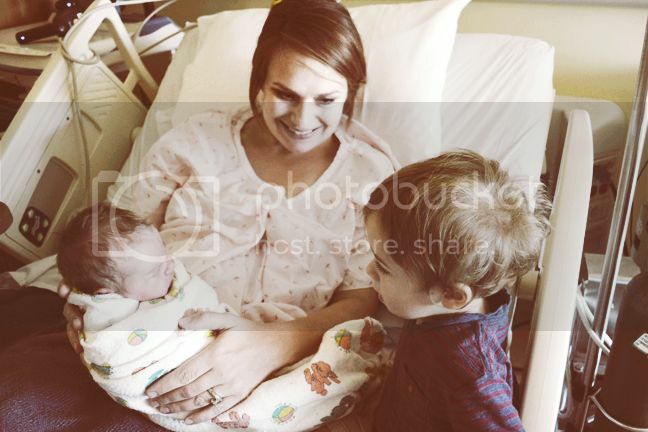 Thanks so much for sharing your story, how you managed to get pictures taken and times written down I don't know because my daughter's birth was a blur (yes, I did get an epidural and my views were totally like yours, if I ever have a second child I would go the same route but you never know right). Congrats again, enjoy your beautiful baby girl. Congratulations Paige, and Chris and Fox :) I am so happy for your little family!! wow Paige, what a story and what an amazing blog post to show Jane someday! I went natural with my daughter, not my choice!! the nurse forgot to call the dr. for the epidural and by the time he came it was too late, sooo not fun, but what can you do? :) Jane is a gorgeous addition to your family and I can't wait to come back here daily and see her and Fox grow up!! Wow. What a whirlwind! I know that was your worst nightmare coming to pass, but you did it and gave birth to the sweetest little baby who loves you even more because she understands the sacrifice you made to bring her into the world. Good job, love! You are incredible! You crack me up! Love reading your stories. This one is awesome. Congratulations again on your sweet baby girl. 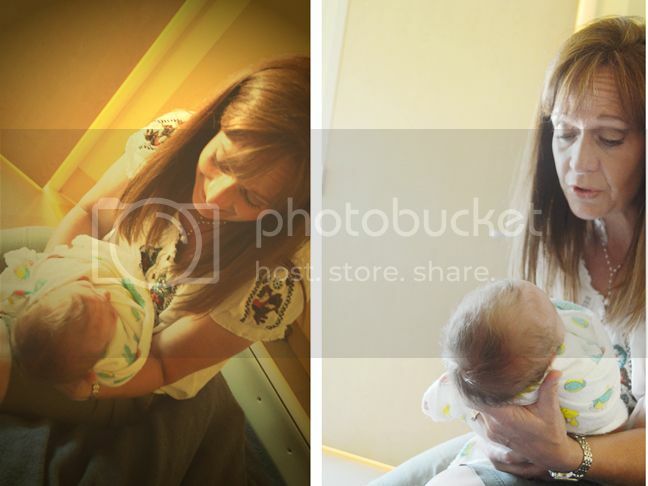 I love the pics of Fox seeing Baby Jane for the first time! He is def. going to be a great big brother! 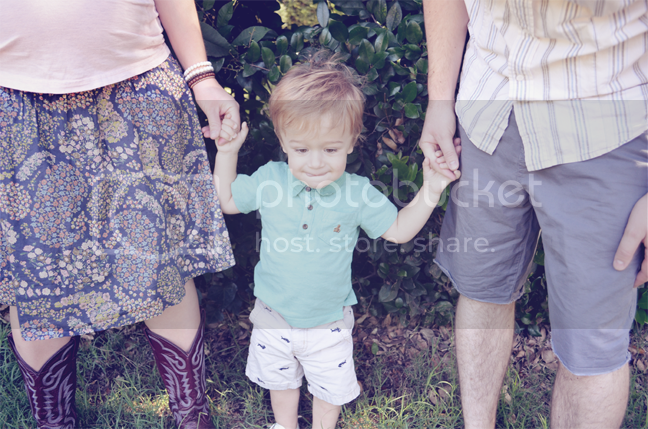 I cannot wait to see your other photos and new photos of you as a family of 4! Congrats are in order for you and the new baby. I can't believe you did it natural (wether you meant to or not). That is quite a feet. You are obviously much stronger than you think you are! Good job! She is beautiful. I'm so glad that you have your baby on the outside! She is a doll. Props for the natural birth :) You know I love that kind of jazz... just imagine that in a 25 or 12 hour long labor though... I'll wish your 5 minute labor on myself for the next one! Oh my word! How did I miss this story?! YOU are amazing. That is my greatest fear I swear. I'll keep the babies coming.. but you better keep the meds coming too! lol YOUCH! You rock. Nuff said. Ohhhh, I've been so absent online lately! I completely missed your wonderful news. Congratulations to you and your family. 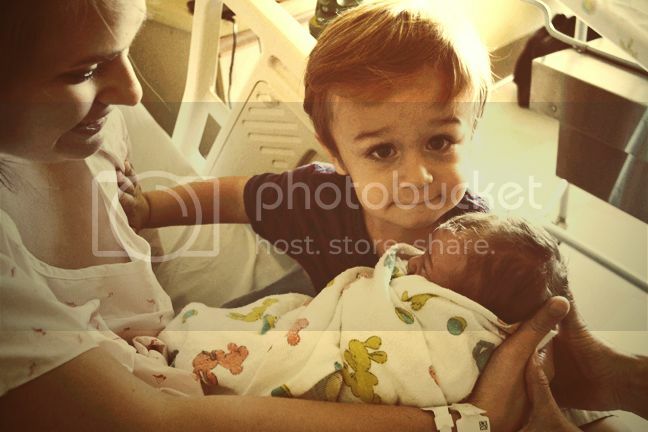 I love the photo of Fox looking at his new baby sister and you looking at him. So precious! It's been a while - almost a month! I haven't had time to check all my blogs... Though I haven't had a baby (and want one all the time) I am happy you got to experience a natural birth. Recovery should go a lot quicker. I am not familiar with the "money man"? ?